Avocado: Alligator pears are the preferred weight loss smoothie thickener, or ingredient that provides that signature smoothie creaminess. They supply ample healthy fat, which will keep you satiated and satisfied until your next meal, and an array of health promoting vitamins and minerals. Berries: Any kind of berry, strawberry, blueberry, blackberry, and raspberry for instance, add a ton of flavor to a smoothie without adding very many calories or sugar. Additionally, they are high in fiber, which helps to keep you full, and antioxidants for your overall health. Chia seeds: The same little seeds that make hair grow on ceramic animals are a great tool for weight loss. They are packed with fiber and protein to help keep you feeling full and satisfied and they contain numerous healthful nutrients like calcium, antioxidants, and omega-3 fatty acids. They are also known to absorb toxins from your digestive tract. Many of my recipes call for chia seeds or chia seed gel. I prefer the gel because it helps unlock the nutrition, is slightly easier to digest, and adds to the creaminess of your smoothie. To make chia seed gel, combine equal parts chia seeds and water in a small container and let sit for 5 – 10 minutes to gel. Stores in the fridge for a good month. Cinnamon: The popular spice helps regulate blood sugar levels by improving the metabolism of glucose. This results in a reduction of the amount of excess blood glucose that can be stored as fat. Abdominal fat, studies have shown, is more sensitive to the effects of cinnamon than fat from any other part of the body. Coconut oil: This is my number one smoothie weight loss ingredient. As you’ll soon read all about below, ample healthy fat in your smoothies and diet is imperative if you’re serious about losing weight, and achieving optimal health. The predominant fats (medium chain) in coconut oil are used by the body for energy as opposed to being stored as fat. This superfood keeps you satiated, energized, and feeling good. Go with an organic virgin coconut oil for your smoothies and internal consumption. For more information on this wonderful food, click here. I get my coconut oil from Mountain Rose Herbs (Coconut Oil Unrefined – also Virgin) and Tropical Traditions (Gold Label Virgin Coconut Oil). If you order from Tropical Traditions by clicking on that link and have never ordered from Tropical Traditions in the past, you will receive a free book on Virgin Coconut Oil, and I will receive a discount coupon for referring you. I believe in full disclosure. Greek yogurt: Compared to other styles of yogurt, Greek yogurt is much higher in protein. This means it can fill you up and keep you fuller longer. Opt for the full-fat variety, and stick with plain. The flavored varieties usually have a lot of added sugar. Healthy fats: Healthy fats are vital to your overall health and help keep you satiated for hours. Totally denying fat is not a way to lose weight. You will only feel unsatisfied when you eat. Consuming ample healthy fat is actually an integral part of any weight loss plan. Include fats in your smoothies by adding avocado, coconut oil, or nuts and nut butters. If you make elixirs, butter and cream are good options too. Pulp from fruit: If you have a juicer, you know that in addition to the juice, you end up with a pile of throw-away pulp. This is all of the fiber from the fruits and instead of throwing it out or composting it, you can add it to your smoothies for a natural source of fiber. Stevia: If the fruit you add to your smoothies is not enough sweetness for you, consider using stevia. This natural, zero-calorie sweetener comes from a plant and is free from the side effects and possible risks of artificial sweeteners. Tea/water/ice: Many smoothie recipes call for milk or fruit juice to create the right consistency. To avoid the extra calories, substitute them with tea, water, or ice. A fruity, herbal tea is a good substitute for juice. Green tea contains healthful nutrients, including a compound thought to aid in weight loss, and it has a mild flavor. For a consistency more like a shake, use ice. There are plenty of great foods and supplements to put in your smoothies that will give you flavor without excess calories. There are also some pitfalls. Too many people assume that any smoothie is a healthy option, but there are some ingredients that should be avoided if you are using smoothies as a weight loss tool. The most important thing you want to avoid in your smoothies is excess sugar. Even “healthier” sugar from natural sources such as fruit, honey, and maple syrup should be minimized. Canned fruits or vegetables: Fresh produce is always best, but when you can’t find what you want, turn to frozen foods before cans. Canned fruits and vegetables often have added preservatives or sweeteners that increase the amount of calories. They have also lost a significant amount of their nutritional value. Fresh and frozen veggies and fruits maintain nutrient content much longer than canned products. Dairy: Dairy products like milk, ice cream, or frozen yogurt are common ingredients in smoothies, but they are chock full of extra calories. There are exceptions, such as raw milk and plain, full-fat Greek yogurt, which is high in protein and low in sugar, but most dairy should be avoided. Fruit juice: Juice is often high in sugar and calories and low in nutritional value, especially store-bought products. Many contain added sweeteners, and all have lost the fiber of the whole fruit. A limited amount of 100 percent juice is fine, but too much will just increase your total (bad) calorie intake. Some Protein powders: By “some” I mean those full of fillers and suspect ingredients (list of ingredients is a long list of hard to pronounce words), which don’t support healthy weight loss. A clean protein powder is perfectly acceptable. Don’t feel like you have to use a protein powder though as there are many healthy whole food sources of protein such as nuts, nut butters, seeds, Greek yogurt, and gelatin. If you’re not sure if a protein powder is right for you, give one a try and see how you respond. If you’re wondering, I recommend Sun Warrior protein and these other clean protein powders. Sweeteners: If your smoothie tastes very sweet, you are probably over doing it on the sweetener and potentially consuming too much sugar for a weight loss plan. Stevia is a natural, no-calories sweetener that you can use. Other good sweeteners, such as honey and maple syrup should be used in moderation. For the full download on sweeteners, see my article on the best and worst sweeteners. Too much sweet fruit: Whole, fresh fruits are good for you, and a natural way to add flavor and a little sweetness to your smoothie, but too much can be a problem. A lot of fruit in one smoothie can spike your blood sugar and cause digestive problems. A good rule of thumb is to stick to avocados and berries. Small amounts of sweeter fruits such as banana, apple, mango, and pineapple is fine, but keep those to a minimum. Smoothies high in sugar are a recipe for weight gain. For more information on the ingredients you want to avoid like the plague, check out my article on what makes a smoothies unhealthy. As you work towards your weight loss goal with tasty smoothies as your tool, keep in mind that the healthy way to lose weight includes more than just dietary changes. Your smoothies, if created thoughtfully, will provide you with many of the nutrients you need including protein, carbohydrates, good fats, and vitamins and minerals. But, don’t forget to eat healthful foods in addition to those smoothies. Get plenty of vegetables, healthy fats, high quality proteins, whole grains, and moderate amounts of fruit at your regular meals. Other factors that contribute to weight loss are adequate sleep (underrated), stress reduction, hydration (your liver doesn’t metabolize body fat well when burdened by dehydration), and a positive outlook. There’s often an emotional component preventing people from losing weight, which is rarely easy to address. Resolving issues in your relationships, career, or past, often leads to profound breakthroughs. Mindful eating is another strategy that besides being a good practice to help us slow down also often results in weight loss. When you bring mindfulness to your meals you usually make better choices (reach for and consume less junk food), eat less (your gut has ample time to signal to your brain when you’re full), and appreciate the food more. To practice mindful eating, remove any distractions such as TV or reading, take small bites and chew slow (tough one for me) and notice the color, smells, and textures of your food. Please don’t dismiss this simple practice – it can yield profound results. Everyone’s body is different and not all of us are meant to be as skinny as a supermodel or have 6-pack abs. Learn to love your body and don’t get caught up in the game of comparing yourself to others. Staying active while also eating right, getting ample sleep, reducing stress, and enjoying healthful and nutritious smoothies are steps you can take that will get you to your goal weight before you know it. Smoothie diets have become quite popular. I want to make it clear that I’m not an advocate of smoothie diets. I recommend a smoothie for breakfast and two regular meals for lunch and dinner. Substituting a smoothie for another meal once in a while or having one after working out is perfectly acceptable. Note, most people enjoy smoothies for breakfast. Having your one smoothie for the day at lunch or dinner is absolutely fine. I’m not a fan of smoothie diets, or detox diets, because they’re often undertaken as a quick fix. These diets usually involve severely restricting calories, which is not easy and can actually cause you harm. You may lose weight on a smoothie or detox diet, but it’s usually temporary. In the long run you end of gaining the weight you lost back and then some. This yo-yo dieting is not something you want to get caught up in. I recommend a “real” diet. One based on traditional foods, those that our great grandparents consumed, and in many cases our species has consumed for hundreds and even thousands of years. This diet is based on the work of Weston A. Price and what I personally consume and advocate. For more information, see WAPF Dietary Guidelines. After experimenting with vegetarianism and veganism I found these dietary guidelines work best for me and have been following them since late 2010. We are unique individuals with unique dietary requirements. There’s not one perfect diet that everyone should be on. I recommend experimenting and paying close attention to your body and how you feel to arrive at what diet most resonates with you. For each of these smoothie recipes place all of the ingredients into your high-speed blender and blend for around 30-45 seconds or until nice and smooth. If you don’t have a very powerful blender and your coconut oil is in liquid form, you might want to blend everything except the coconut oil first, then drizzle it on and blend for another 5-10 seconds to avoid clumping. As always, feel free to add and subtract ingredients based on what you prefer and have on hand. Have you lost weight with smoothies? Do you have questions about the above weight loss advice? I’d love to hear from you – please leave a comment below. I have been on weight loss smoothies for over a month now. I have lost about 1.5 kgs only so far. what am I doing wrong? How can I increase my weight loss so I lose 1 kg in 2 weeks? For my and others reference, 1.5 kgs equals 3.3 pounds. Losing weight is unique to everybody and depends on a number of factors such as what you eat when not consuming smoothies, exercise (especially the type), stress, and sleep. I’ll email you to obtain more information so I can provide appropriate recommendations. how do you blend the ryan’s ideal weight loss smoothie the 1st one you have on the list. is it all at once or one at a time. Donna here..what are your thoughts on chia and flax seeds both in a smoothie? Both flax and chia are perfectly fine. I prefer to rotate, mainly to save money. I recommend one smoothie and two meals a day. You’re free to try two smoothies and one meal a day. Fruit and veggies are goods in between snacks. Hi Julie what protein powder do you use? I am 16 and am about 15 pounds over the recomended weight for my height and age. Is there any way to drop 10 pounds in 1 week. I know it may not sound exactly safe. But I am in desperate need to loose the weight fast. I am a HUGE PROCRASTINATOR! because of my high anxiety and depression. And my boyfriends extended family is coming in to town for a few days and I want to feel comfortable in my body around them. Which is very hard to do now… If you know of anything I can do to drop as much weight as I can this week it would be GREATLY appreciated!!!! I’m sorry, but I don’t have any recommendations for dropping that much weight in a week. As you stated – it’s not exactly safe. The military diet DOES NOT WORK……just an FYI. Your doctor recommended a rapid weight loss plan of 10 pounds in 3 days? Your doctor should have his license revoked. That is incredibly unsafe. The safest weight loss plan is at the very least 2-3 lbs per week. If a doctor is telling you ways to lose 10lbs in 3 days, find another doctor. actually, there is the cabbage soup diet Dr’s give patients who are getting ready for surgery, if they are overweight, and usually the loss is around 10 lbs or more, it isn’t meant to be an perm diet, it is a quick way to drop 10 lbs, tho not sure I will ever do it again. Me and my husband have done it a couple times when wanting to lose some quick weight, but got SO sick of the soup both times, and you had to follow a regiment of specific foods for each day. Hi Ryan, I am new to this I have bought some Linwoods milled flaxseed, almonds, Brazil nuts, walnuts & co-enzyme Q10 (in a packet). Will this be ok to add 1 teaspoon to my smoothies? I’m not qualified to answer that question – if co-enzyme Q10 is ok to add to your smoothies. You should consult a medical professional. The other ingredients you mentioned are great! Hi Ryan I was wondering is there something I can substitute for the coconut oil? I am allergic to coconut I love these smoothies but am wondering if anything will change with the oil? What I’ve been using more and more lately for variety is ghee, another excellent source of healthy fats and similar in consistency to coconut oil. Would avocado oil work as well? Hi Ryan, I need to loose forty pounds in order to go into the Navy. The ingrediants I have at my house are bananas, flaxseed, chiaseed, cinnamon, almond milk, coconut water, dates, and Pb2 peanut butter. How much of each of these would I need to put into my smoothie? And oh, protein powder. the stevia and yogurt are just added as experiment for sweetener, would it be better to drop yogurt? also, what are more beneficial for weight loss? chia or flaxseed? i have some ground flax as well here. any input or suggestions would be much appreciated. Yogurt is good, although I recommend a regular or full-fat one. It’s a toss up between chia and flax seeds for weight loss. Rotate them for variety. Nothing else to add, you’re on the right track! thanks for the quick reply. one thing i forgot to mention in last post, the smoothie came out better than i thought and was absolutely delicious! I’m def on this plan. *also picked up some extra virgin coconut oil, cinnamon, and cayenne today so I’ve got some more experimenting to do ha. Hi Jesse, I just made it and what I did is put a cup of loose and fresh spinach (not baby) since I did not have Kale, and to keep it low fat since I did not have yogurt, I put half a cup of water and half a cup of Organic classic vanilla soy beverage and no stevia. OMG it’s good! thank you for sharing it! :-) have a great day. Hi! Is there anything that I can substitute for the protein powder in the above recipe? You can substitute gelatin, a nut butter, or Greek yogurt for comparable protein, or simply omit. Yes, that’s a great option, Deborah. Have you lost wait drinking smoothies. I came across Ryan’s site researching Chia seeds vs Flax seeds. His smoothie recipes are A.M.A.Z.I.N.G! And SO DELICIOUS! I have one of his smoothies after a 4min warmup in the morning. Then I do 20min on the elliptical at home. I have a yogurt or 2scrambled eggs w/lean meat(turkey, chicken, or flank steak). I drink water or green tea ALL DAY! Depending on what your body tells you, have another of his smoothies for dinner OR baked salmon with brown rice & a green veggie( green beans, asparagus, etc.). It’s been 2wks since I found his site and I’ve gone from 139lbs. to 128lbs. My goal is 125lbs. I’m 60yrs. old & just needed some “tweaking”. I cut out ALL LIQUOR! It’s just not worth the extra effort to work it off. His advice is SO helpful and recipes are nutritious & delicious. I’m about to try his “BONE BROTH SMOOTHIE”. I’m just reading your smoothie ingredients. I live in an area where I may not be able to find flaxseed and definitely chia seeds. Where would I find these items? Also, the only place I could find coconut oil was target. I was using it for my hair. It’s by Spectrum. The label says expeller pressed organic coconut oil. Is this alright to use? Or should I order it online? I use coconut oil in my hair too. You want cold pressed/unrefined for food use. The expeller pressed is usually refined and not meant for consumption. Mountain Rose Herbs also carries coconut oil. Thank u.. I hope ur smoothies help me.. I have found chia seeds and flaxseed at Big Lots, believe it or not! Hi Ryan, besides coconut oil, is there anything else to use I have ghee how much of it do I use? Ghee is a great substitute for coconut oil. Start with 1/2 tablespoon and work up to 1 tablespoon. That smoothie looks great, Rahima! Use about 1/2 to 1 tablespoon of ghee. Smoothies are typically 1 to 2 cups in volume, but can be much more if you desire. My name is Grace. I really need to loose some weight in order to fit in my dresses again. I don’t have much ingredients for smoothies here but I have banana, orange, avocado, green tea, lemon, lime n cinnamon. Pls how do I blend that to get a good smoothie n how do I make yogurt? Thank u. That should taste pretty good. Simply add the ingredients to your blender and blend away (for about 30-45 seconds). You may want to search the internet for yogurt making instructions. It’s not something I have much experience with. It’s easier to buy, IMO. I actually recommend 2 regular meals and one smoothie, Erica. It’s best to consume your last meal of the day 3-4 hour before going to bed. That way your digestive system is not working while you try to sleep. Yes, most people consume their daily smoothie for breakfast, Melissa. Hello Ryan, How do I obtain your e-book on smoothie recipes? Thank you. Hi Kim, look for an email to confirm your subscription to my free newsletter after which you’ll get access to my e-book. Hi Ryan, there was not a place for me to fill in my email address to subscribe. I subscribed you, Kim. Did you get an email? The opt-in box is on the top-right of my site. Hi Ryan, should I be drinking one type of smoothie everyday or rotate to different smoothie versions you have mentioned? There’s no hard and fast rule here. I typically have about the same smoothie, give or take an ingredient, for weeks at a time. Then switch when I need something new and/or different seasonal ingredients become available. Do you have a smoothie website aside from this where we can msg for advise rather than on a wall? I had cancer and so my taste buds are a mess. I can’t eat things like “cinnamon, Cheyenne, thick yogurts etc. I like things like bananas, berries, peanut butter, coconut oil, almond milk, frozen avocado/greens. Not sure what’s better flax oil or ground seed. I have chia I haven’t used yet. Need best recipe for weight loss. You can email me directly if you’d prefer to ask a question in private. Just fill out my Contact form (link at bottom of site). The recipes above are the best I have to offer for weight loss. Sounds like you may need to tweak them to suit your needs. Neither is necessarily better, I’d rotate between flax oil and ground seed. All of my recommendations can be found in the article above, Akua. Good luck! The recipes above are my top recommendations, Angel. Hi Ryan, great combos in your recipes! Very few smoothie related sites which recommend healthy fats so I’m glad to have stumbled across yours. Please let me know your thoughts on my typical smoothie to make it a whole meal…I try to add nuttiest boosts so I can mask them and still consume them. I am a vegetarian. I have a small glass for breakfast snd another smsll one for lunch. I have two regular meals after that. Overall it’s not made too sweet, just enough to make it palatable. On first glance your smoothie looks fantastic and quite healthy. I’m sort of nitpicking, and you might have guessed this one recommendation: a healthy fat such as avocado or coconut oil. Adding 1/2 to 1 tablespoon of coconut oil would make this a superstar smoothie. Would you mind terribly providing the amounts for your ingredients? This sounds interesting and I’d like to try it. Thank you. Is Tumeric a good thing to incorporate for weight loss? Turmeric won’t directly aid in weight loss. However, it offers so many other health benefits that I encourage you to include it. Please confirm the following recipe is correct or should be avoided for weight loss smoothie. 1 cup fat free/skimmed milk + 1 cup fat free youghurt + half banana + half apple + 4 pieces almonds(optional). Please suggest will the above smoothie will be helpful to loose weight or it may gain weight. fat free milk & fat free yoghurt key points. Awaiting for your responce to he earliest. Did you read the article above? :) Fat free is precisely what I don’t recommend. Please read the article and my article on healthy fats (linked to above). Regardless of the fat free things, is the majid’s combination is healthy for diet? Yes, if the milk and yogurt are full-fat or regular then Majid’s recipe is healthy. Great website! thanks for all the recipes! You said don`t use protein powder if you want to lose weight, but what if i take the smoothie for breakfast to make it a complete meal? Natural protein sources (Greek yogurt, gelatin, kefir, avocado, chia seeds, goji berries) are preferred, but in a breakfast smoothie for someone who needs ample protein first thing in the morning supplementing with a protein powder is perfectly fine. Actually, the protein I recommend, Sun Warrior, is more like a multivitamin with protein. Superfood smoothie recipes are all excellent for weight loss. Better yet, do green smoothies with superfoods! My name is annmarie I’m 5’8 and 197lbs. I was eating low fat greek yogurt 3x a day with granola (which is probably why I gained 20lbs)now I’m drinking kale,ice cubes,water frozen banana, strawberry, pineapple and mango. Is that too much Im confused with all the information. What you’re drinking should be once a day as a smoothie. It is high in sugar with all the sweet fruit. Try eliminating the banana and instead use 1/2 avocado. Strawberries are good. Use only pineapple or mango. Greek yogurt (full-fat) with granola is a good snack, but not 3x a day. Ryan, this is Benetta, I’m going on the smoothie diet today and I put frozen banana, strawberries, spinach, skim milk, and allure sweetener. I want it for breakfast, lunch, and dinner – so what am I’m going to be doing wrong, could u help me? Please read this post (and comments) in its entirety. I recommend a smoothie for breakfast and two regular meals. I’m not an advocate of the smoothie diet. Your smoothie could use more fat (avocado and coconut oil) and less sugar. Try honey, maple syrup, or stevia as the sweetener. Just trying to make sure that which ever way you make a smoothie it’s healthier to have once a day? If you have a challenge with chewing food than perhaps an exception can be made to have 2 smoothies a day, Chido. Long term, I would try to consume just 1 smoothie and 2 meals though. I have lost 10 lbs over the last eight weeks after increasing my water intake and starting on the green smoothies for either breakfast or lunch. I began working out this week and I purchased some Sun Warrior chocolate protein powder to have a protein shake after my workouts per the advise of a physical trainer that I follow.. would you say yes or no about the protein powder sense I do use a variety of other natural proteins in my green smoothies? Great to hear you started working out. I think the extra protein is a good thing to ensure you’re getting adequate protein after workouts. With Sun Warrior you’re getting protein along with some vitamins and minerals. I make my smoothies at night so I don’t wake the house in the morning. I noticed that my smoothies after I make them are a very good color of blue or burgundy but after a night of being in the refrigerator (6 hrs.max) the color is always the same olive green. I do use spinach, flax seed (grounded), and hemp protein. I also make my smoothies at night, but found that if I freeze it in freezer bag, and take out right after waking the next morning, allowing it to soften at room temperature while I’m getting ready for work, the color is pretty much like when first blended and it tastes just as fresh. I too have been trying to lose weight. I’m 5’2 and for my Height I’m 136, is that a Healthy weight for my size? That’s a good question. I’m really not sure what’s considered a healthy weight for someone your height. If you feel good at 136, then I’d say yes. I want to try smoothies for losing weight but have no idea how to go about it. The recipes are great but when should they be consumed? Is it replacing a meal or meals? How many smoothies should one consume in a day? Most people, including myself, have a smoothie for breakfast, then two regular meals for lunch and dinner. You could also replace a second meal, usually lunch, with a smoothie. Pay attention to your body and how you feel if you try two smoothies a day. There are smoothie diets out there consisting of 3 smoothies a day, but I personally don’t advocate that. Hi Ryan, you advocate smoothie for either breakfast or lunch but I was wondering if it could work to have my smoothie for dinner instead. Would appreciate your thoughts … I have so many things on after work over the course of a week that I thought I might like to smoothie it as a quick dinner which would stop any snacking to get through my studies etc. Sure you can have your smoothie for dinner :) The most important thing is that you’re consuming smoothies, not which meal you have them. Great questions. Sugar from fruit is better than refined sugar that’s present in a plethora of food and drink, and in the context of the entire fruit doesn’t absorb or spike your blood sugar as much. However, too much sugar even from fruit can be detrimental to your health. Everyone’s body is different and I recommend paying attention to how you feel. For some people a banana and frozen berries is too much sugar. The other ingredients in your smoothie also factor in. Fruit only smoothies can be sugar bombs and should only be consumed occasionally, say for dessert or a snack. For your everyday smoothies I would stick to mostly frozen berries and maybe a small banana. I prefer thickening my smoothies with avocado and chia seed gel instead of banana. For losing weight, the less sugar the better, even from fruit. When I first discovered the various superfoods I immediately ran out and bought them too :) I have a few go to superfoods that I consume on a daily basis (coconut oil, chia seed), others I consume fairly often (maca, cacao, spirulina, goji berries), and the rest here and there. How often and which superfoods I eat changes from year to year based on my nutritional needs and listening to my body. As you try the different superfoods I think you’ll find some stick and others don’t. However, you can consume a host of them daily, it just gets kind of expensive. I bought a powerful blender today and I was browsing for smoothie recipes. I tumbled across yours site , I am happy that I did. Wonderful recipes and I am planning to start right away. I have Hypothyroid and I read in an article that coconut oil helps in regulating it and in one of your comment you mentioned that Coconut oil is a super food like chia seeds. Can you please tell me how much of Coconut oil I should add to a smoothie , let’s say for the berry banana smoothie you have mentioned in your site. If you’re brand new to coconut oil I would start with 1 teaspoon and quickly work your way up to 1-2 tablespoons. Don’t worry, you really can’t over do it with coconut oil. I like the different recipes. I have my own that I created, but I love the Cayenne add to a smoothie. I use less than a handful of each frozen fruit: strawberries, blueberries, raspberries and pineapple. Then I top it off with a Splash of Minute Maid 100% Nourish Your Brain Fruit Juice just to add a little flavor. In almost 8 weeks of adding this to my diet everyday plus completely changing what I eat and weekly exercise routine I have lost 35 lbs. I have been out of town for work for Months, since my transformation I have had 3 co-workers buy blenders for their Hotel room and started doing what I do. I also had the head of Housekeeping yesterday ask me for my recipe as her and some of the Hotel staff were wondering what I was doing. I will check back often to get new ideas for my smoothie, but definitely adding the cayenne in. Thanks! Congrats on losing 35lbs! That’s awesome. Eating healthier, which usually includes smoothies, and exercising are two keys to shedding unwanted poundage. What’s even cooler is the fact your co-workers and hotel staff are taking notice and following in our healthy footsteps. Love the ripple effect. Your smoothie recipe is right up my alley. Hadn’t heard of Green Vibrance Superfood, after a quick Google search it looks likes I’ll have to give it a whirl. I like this smoothie but I need coconut oil. Which ingredient would that replace? I would simply add coconut oil and not remove anything, Kimberly. I only drink one a day usually in the morning for breakfast. I also changed all my eating habits as well plus a weekly workout schedule. I hope you like it and it works out for you as did for me. Thank you so much…I am giving this try. Good luck! ! Would love to know how you’re progress is going. If you have any questions on what I did, please feel free to email me at ericmcarthur73@yahoo.com. Ryan, I love the cayenne add. Love it a little spicy. Thanks for this inspirational smoothie post! Congratulations on your weight loss as well! May I ask if your food changes included lower carb intake and eating clean opposed to processed food intake? I currently do zumba and kickboxing and have just started the healthy smoothie WOL 2x a day. My intention is to do this as a replacement for breakfast for the next four weeks and on occasion dinner to take down some pounds. I exercise 3/4 days a week. That’s a good smoothie recipe, but I would make one key addition, coconut oil, for healthy fats. Start with 1 teaspoon and work up to 1-2 tablespoons. The coconut oil will keep you satiated, increase your energy, and help you shed pounds among other health benefits. See my article on coconuts and coconut oil for more info. You might also rotate avocado into your smoothies on occasion, maybe in place of banana. Cinnamon and a high quality salt such as Celtic sea salt are other good additions. You are a life saver! I have been wanting to make a good smoothie but I always felt like I was missing something! I am highly allergic to bananas and most smothies use them! I have been trying to figure out what to replace it with! I am going to buy avocado tomorrow!!!! Thank you thank you thank you! I do try, Amy :) I have a feeling you’ll really like the creamy, thickness of an avocado smoothie. I Googled smoothie recipes and found yours! Gong to the store tomorrow when I wake up to buy the ingredients!! Thanks so much for posting this!!! Ill I’ll let you know if I lose any weight which is my goal!! I have been looking for a smoothie site and came across yours. Thank God for that I love it cant wait to start. Good luck on your healthy smoothie journey, Julisa! Hello I just bought me the health master elite blender and plan on starting a smoothie diet monday and im looking for any help possible, I am new to all the coconut oil, and flax seed, and protein powder so any suggestions to help me out? Great to hear you purchased a good blender and are ready to rock-n-roll with smoothies. My advice is to start by having a smoothie for breakfast every day. If you’re brand new to smoothies begin with simple recipes and one at a time incorporate the ingredients you’re not familiar with into the mix. Those you like, keep around, those that don’t resonate with you, discard. First I’ve heard of Parachute coconut oil, which appears to be for external and cooking purposes only. I would find an edible coconut oil. Just stumbled upon your site. I am in need of losing 25 pounds and want to lose it in a responsibly healthy manner. I’ve looked at other sites and they are full of unwanted ‘noise’ or make it sound daunting. You have kept it simple and to the point. I am going to start today by having a smoothie for breakfast and one for lunch when possible as I don’t have the means at work to blend a smoothie. However, I am going to experiment with a make ahead version that I can keep in the fridge at work and give a shake when ready to consume. I think using greek yogurt and avocado will be key success factors in both keeping it thick and blended as well as support the weight loss. Thank you for your site – It has inspired me. Here’s to losing 25 pounds with relative ease by eating healthier. That’s really the only way to proceed. Roughly 80% of people who go on suspect diets gain back the weight they lost and then some. Bringing a smoothie to work for lunch is a great idea. When I travel with smoothies I typically store them in a Blender Bottle – http://www.blenderbottle.com/. Glass (mason jar) is ideal, but not always practical. I usually don’t have time for breakfast. Making a smoothie the night before is a great idea. Just be sure to refrigerate it. A desire to lose weight is where it all starts. I would begin by consuming a smoothie for breakfast every day. My site is full of recipes to choose from. Try to incorporate a good healthy fat into every smoothie such as avocado and/or coconut oil, and limit the amount of sweet fruit. Stick to berries and banana if possible. Being a full-time mom is a workout in its own right; so don’t worry about that. Although the occasional walk is always good. Without knowing more about your situation and diet it’s hard for me to make recommendations. If you email me and provide more info I can point you in the right direction. That’s tough to answer without knowing more about you. Please read my response to other comments and if you have specific questions drop me an email. I know that too much fruit can spike up you sugars and I am insulin resistant so I don’t want that, that is the reason why I really measure my fruit. I want to know if what I am putting in my smoothie is ok or what changes can I make? Or do you have a special recepie for a smoothie for people with insulin resistance? Your recipe looks good. The one ingredient I’d like to see in your smoothie is coconut oil, 1 tablespoon. Healthy fats are really important. Chia seeds are another ingredient I recommend, 1 tablespoon also. They’ll help slow down the digestion of sugars which may spike your blood sugar. Additionally, you could add a dash of cinnamon and sea salt for added nutrition and taste. Substituting avocado for banana is something else to try. Just stumbled upon your site and I love it! I was searching for smoothie recipes to aid in weight loss as well as healthy ingredients for immunity disorders to help curb my symptoms and decrease inflammation. Do you have any advice in this regard? Also, this is my most recent smoothie creation, Can you offer any alternate ingredients that might have been a better choice? Please see my recent article on reducing inflammation with smoothies. You’ll find info on anti-inflammatory ingredients and a link to one of my most popular smoothies – Spicy Anti-Inflammatory Smoothie. Immune disorders or auto-immune diseases are tricky. Below is a link to my immune boosting smoothies post. I’d also look into medicinal mushrooms such as reishi and chaga, both of which are immune system modulators. I prefer tinctures, but powders can be added to smoothies. Your smoothie recipe looks mighty delicious and healthy. I would add coconut oil (1 tbsp) for good healthy fat that also aids weight loss. Chia seeds are another good ingredient to add. Most apple juice is pretty high in sugar; so I’d substitute water or milk. Just went out and got some coconut water to try as a substitute. Also I’ve followed your links and can’t wait to pick up some healthy ingredients and try some of the great recipes I’ve found here. Where can I find the medicinal mushrooms you mentioned? Health Food Store? Also, can you recommend any other types of powdered supplements helpful for auto-immune disorders that I might add to my smoothies? I would like try using kale however I’ve never even tried it and have heard that it can be bitter. What are some ingredients that might work well to counter the bitterness? So many thanks for this great site and your help. Looking forward to shedding some pounds and more importantly gaining a healthier body. Good wishes to everyone here! I’m really not sure which other powdered supplements help auto-immune disorders. I would research that and try what you find. You can add pretty much anything into a smoothie. Anything sweet will mask the bitterness of kale, although it’s not that bitter IMO. Start with small amounts. Good luck shedding poundage and improving your health! Hi, I have a stomach problem, GURD. I would like to start drinking smoothies to lose weight. I have gained weight since I have this problem. What smoothies should I drink to lose weight? The smoothies I recommend for a digestive issue like GURD are similar to a weight loss smoothie. I would address GURD first. These two articles will steer you in the right direction. I making it for myself and my boyfriend. After i read your website, i think i should omit the milk and use water instead. And it seems like coconut oil is a good thing to add too. I am also trying to lose weight so any help is appreciated. Your assumption is right, omit the milk in favor of water unless you have access to raw milk, or use an organic almond or coconut milk. Coconut oil is precisely what I recommend you add to your smoothies. I’d start with 1 teaspoon and work your way up to 1 tablespoon of wheatgrass, or follow the serving size on the package. Wheatgrass is extremely nutrient dense and contains an array of vitamins, minerals, and chlorophyll. I personally don’t consume it very often because my go-to green superfood powder (Boku) contains it. Spirulina is another super green that’s very high in protein, 65-70% pure protein. Good luck with the smoothies and shedding unwanted poundage. Hi Ryan, these are my smoothie ingredients. Carrot, apples, spinach, broccoli, pineapple and some berries – what do u think. Thanks. Hi Ryan, I’m on a detox plan … which lasts 21 days, so that they make a healthy eating habit. These 21 days breakfast and dinner consist of smoothies … But my teacher says, you add half half my scoop ‘whey protein’ Vanilla at GNC. if you want to lose weight and slim … Should I remove this protein powder smoothies? My teacher tells me, used a certain amount of protein or about 29g 10g bringing a scoop of whey protein, to keep satisfied for a long time … And that mitigates a breakfast and a dinner. I would stick to the recommendations of your teacher. Since you’re on a 21 day detox diet and likely not eating as much as usual the extra protein is probably good a idea. Although, I would be weary of a GNC protein. Might want to research that to ensure it’s high quality. See my Resources page for the protein powders I recommend. When you’re back on a regular meal plan you can probably do without the protein powder. Experiment and see how you feel. I needed your website! I needed all these comments and encouragements! Today is my turning point to regaining my figure and fitting into the lovely garments I own. I think I have gathered so much information about juicing and smoothies and raw food eating that that I was flummoxed in a state of overwhelm. I’m totally into this kind of lifestyle but my approach has been sporadic and with little/no success. Today, I caught sight of my ‘bod’ in the mirror as I walked through a TK Maxx store in London and wow! :( Suffice to say, instruction to self as I passed the same mirror to exit the store was “don’t look, don’t look!”. As soon as I arrived back at work I Google’d “weight loss smoothies” and found you! And…now that I’ve found you, Ryan Carmody, I’m gonna keep you….!! :) Seriously, though your info and the comments and questions – and you answers – are just want the nutrionist ordered. I’m glad you found me and my website :) It sounds like you have the motivation and desire to change, which is key. Don’t try to do everything at once. Integrate healthy habits into your life one at a time and before you know it all your health goals will be reached and you’ll feel great! I’m from New York but I’m currently living (and married) in China. I’ve been obese the better part of my adult life but I think of myself a rather active person compared to the average “slim” figured adult. It’s just eating habits that are killing me. I’m a “skip two meals” or “skip whole days of eating” kinda broad. And I know this is killing my ability to actually lose weight despite an hour or more of exercise EVERYDAY! I’m trying the smoothies at home now, it’s been 13 days and I’m feeling weird. I’m doing a smoothie for breakfast and no lunch (maybe a boiled egg) and all veggies with a little meat for dinner (eating earlier too). Sometimes I snack on some grapes or tangerines. I do the spoon of honey and cinnamon and cayenne every morning and yet, i’m left without any energy at all after a day of teaching. It doesn’t help that my husband, I fit Chinese man, can eat a horse and a half at any hour of the day and gain no fat at all. Ever. period. I’m attempting to remain optimistic though it is proving to be a bit difficult. As you can imagine, everyone around me is naturally stick thin and the metabolism of Chinese people makes me sigh, deep deep sighs on a regular basis. I’m doing my best, but I’ve come here today to ask, keeping in mind the limited “western” goods that I have access to here in Guangdong, what can I do to boost my smoothies for optimal energy/fat burning. We are thinking of having a baby in the next 2-3 years and I want to welcome our little sweetheart into a healthy, strong and happy body. I’ve even injured my knee muscles over-exercising (jumping-rope) and am now on a futile mission to find relief for this immense joint/muscle pain. They’re firm believers of acupuncture here, but 10 painful times afterwards, I’ve decided to take matters into my own hands. Will Glucosamine sulfate be detrimental to the weight loss process? I’ve been told it can help with the knee stiffness. Can I add anything natural to the smoothies to help strengthen my knee/joints/muscles instead? Lastly, the worst part is the effect all of this has had on me emotionally. I am stressed beyond belief. You can imagine the stares and gasps I accumulate here on a daily basis. It is frustrating when I am actually trying very hard. No brownies and things like that here, so it’s helping me to stay away from bad fats a lot. Yet, it is a daily torment. Is there anything I can add to the smoothies to help decrease stress as well? You are a godsend and I am actually nervously and excitedly anticipating your response. Any more information you can give on these super amazing coconut oil, flax seeds and whey would be super helpful. Boy, I hope I can find these things here! Do take care and thanks in advance for all of your help. Thank you for sharing your predicament and allowing me to offer advice. Unfortunately, your situation is all to common. There’s a myth out there that eating less (restricting calories) will lead to weight loss. It may at first, but almost always fails in the long run. Our bodies are extremely intelligent. When restricting calories you’re effectively telling your body there’s a famine. The body’s natural response to famine is to store body fat. What I recommend is starting your day with a nutrient and calorically dense smoothie that contains ample healthy fat. Not only are fats vital for your brain, nervous system, eyes, cell membranes, etc, when consuming in moderation you’re signaling to your body that hunting is good (no famine) and therefore no need to store all that excess body fat. As an aside, healthy fats are also critical in the diet when conceiving to ensure proper brain development, among other things. Poke around my site for other ideas and use what’s local to you. There’s a number of Chinese herbs you could sprinkle into your smoothies such as astragalus powder, reishi mushroom powder, and schizandra berry to increase the nutrition and add a medicinal component. I don’t think glucosamine will hinder your weight loss efforts. Also, getting adequate sleep and addressing stress through mediation or other stress reducing techniques are very helpful in your quest to lose weight. You can do it, Mrs. Zhang! Hi Ryan, I like your posts ans advice i just have a couple of questions for you. I have had two spinal fusions on my L5=s1 and my l4=s1 i am unable to work out and i need to lose weight. I do prefer berry smoothies but yet to make one . I having for breakfast and lunch can i put uncooked oats in there and if so how much. 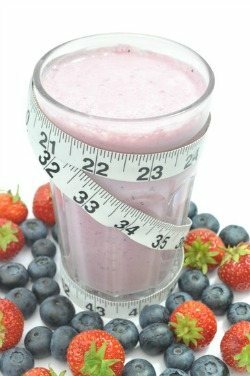 What would be the best berry smoothie for weightloss and can i have more than one a day . I see a lot of good recipes out there for weight loss smoothies i dont know what to do. I need calcium to promote my bone growth and healing as well as vit D can you please help me . Thanks Pamela. Thank you for your time i know it is important and valuable. I advocate a smoothie for breakfast and two regular meals. For calcium, vitamin D, and healthy bones I recommend raw milk and fermented cod liver oil. Check out the Weston A. Price foundation for more info. Ryan, What am I looking for when you say 1 tablespoon of gelatin? Where do I buy it, what form is it? Powder? And if I added all the additional ingredients on your breakfast smoothie, is it better for you or does it just add a little more calories with the same value almost? Bernard Jensen’s 100% Pure Gelatin (powder) is what I use and recommend. You can purchase from Amazon.com. 1 TBSP is the serving size. Adding all the add-ons boosts the nutrition; so yes, it’s better for you. It will also increase the calories. I would strategically include add-ons based on your preferences and desired serving size. If you use all the add-ons you may want to decrease the amount of other ingredients. how many smoothies do i have a day and how many regular meals? I recommend a smoothie for breakfast and two regular meals a day. How many weeks or days it will take before I lose weight? How much can I lose on smoothies? The answer to your questions depends on a number of factors (overall diet, activity, age, etc), Sharon. I recommend a smoothie for breakfast and two regular meals a day. I’m not an advocate of a smoothie diet and therefore can’t offer advice on it. Scroll up and see the recipes in previous comments. Those are perfect for breakfast. i like the idea of adding coconut oil to the smoothies, but is that a problem if you have high cholesterol? Cholesterol: The women in the weight loss study who consumed coconut oil every day also saw an improvement in their cholesterol levels. The level of HDL, or good cholesterol, increased, while the level of LDS, or bad cholesterol, decreased for these women. Those who consumed soybean oil experienced the opposite result. I recommend a smoothie for breakfast and two regular meals. My site, this post and comments are chalk full of good weight loss smoothie ideas. As for what to potentially cut out of your diet, I can only offer what I recommend you DO eat. Here are the dietary guidelines myself and many others follow with great success. Ryan, what a great website. I was wondering the amt of smoothie to consume for breakfast. The recipes you give out do they fill a blendtex container? That would be a breakfast smoothie? which would be how many oz’s. Most smoothie recipes on my site are one large serving, which is what I consume daily. Everyone is different, play with the ingredient amounts to determine how much your body needs. My recipes are typically around 2 cups give or take a 1/2 cup. The standard Blendtec container is over 6 cups. Wanted to check if the veggie smoothies that can be bought from Jugo Juice (like ‘Cant-Beet-This, ‘Mighty-Kale’) are actually good weight loss smoothies? If not, could you please help me with few smoothies that might help me knock off another 10-12 lbs in 2 months or so. I don’t recommend any smoothies from Jugo Juice, most of them are loaded with sugar. Please see the smoothie recommendations for this post as well as in previous comments. Hi Ryan…can I eat fiber one cereal for breakfast and two smoothies for lunch and dinner and drink green tea b4 bedtime, plus intensive 2hrs workout and green fat burner pill for two weeks and lose 10 pounds? The smoothie is a combination of water, apple, blueberry, strawberry, almonds, grapes, pineapple, orange, banana, carrot and broccoli. That’s a good question, and one I’m not qualified to answer. I advocate a smoothie for breakfast and two regular meals. 2-3 high intensity, short duration, workouts are good for one week, with light movement (i.e. walking) in between. Your smoothie recipe looks good. I’d add coconut oil for healthy fat. I have a daughter who is a little on the chubby side from winter would this work on her? The principles in this post, and the comments, will certainly help your daughter lose weight. A good weight loss smoothie for breakfast, two healthy meals, and some exercise and adequate rest should do the trick. I have lost a lot of weight Since July. 155 pounds down to 122. but I have been gaining the weight back even though I run 2-6 miles 3+ times a week. I’m wondering of u had any suggestions in order to lose 10 pounds again, since my weight crawled up to 140lbs. All my new clothes are tight and I’m really frustrated that I gained the weight back. Also, I just read that 5 minutes of kettlebell swings 3 times a week is very effective for women who hit a weight lose plateau. Hello, is natural yoghurt ok in a smoothie when trying to lose weight? Absolutely! I recommend a full fat natural or organic yogurt. Oops! I tried to purchase the correct items to make your Blueberry-Greek Yogurt recipe. Found everything , but got home to see you had written “Full-Fat” plain greek yogurt. I had bought nonfat, plain Greek. Does it matter much? Hello Ryan! I love this smoothie plan, i have been overweight all my life and i wanted this year to be the final year. My biggest problem is that i work at night i sleep during the day. i’ am doing my water intakes and i exercise mostly everyday when i have a chance. My body is always so stiff and my knee hurts badly. what can i do to increase my weight loss success please help. i need energy lots. This is the year, you can do it! I’d start by consuming a healthy smoothie for breakfast and two healthy meals for lunch and dinner. Exercising when you can is great too. Getting your fats straight is also important – info I’ll be amending to this article soon. Check out my article on fighting inflammation with smoothies, there’s some ingredients in there to address what’s likely at the root of your stiffness and knee problems. As far as energy goes, eating healthy, getting adequate sleep, exercise, and reducing stress will help. You may want to try maca too. Have i used too many things? Should i cut anything out? Will this aid weight loss if i have it every morning? Im going to have it tomorrow before work and hope it keeps me sustained until lunch. Thanks for your help. Kim. That’s one impressive first ever breakfast smoothie, nice job! My only suggestion is to include 1 tablespoon of coconut oil, which aids weight loss and will help keep you satiated until lunch. There’s no guarantee, but by consuming a smoothie like this for breakfast and eating two other healthy meals you should be on your way to a slimmer waistline. Is it okay to use vanilla nonfat greek yogurt? Also, do you recommend to freeze fruits and veggies so they last longer? Vanilla nonfat Greek yogurt is just ok. I’d opt for vanilla full fat Greek yogurt. Yes, you can freeze excess fruit and veggies to extend shelf life. I like to load up on fruit, mainly berries, when they’re in season and freeze a bunch for use in smoothies over the upcoming months. Thanks so much, Ryan. You’ve been very helpful. Is flax seed just as good as chia seed or do you recommend chia seed? No problem, Samantha. I recommend chia because flax is slightly estrogenic. You could rotate them, 1 week flax, 2-3 weeks chia or something like that. Was looking for smoothie recipes to aid with weight loss and thank God I came across your website. Your advice and recipes are amazing and I will be starting today. Thank you so much Ryan. Going to get the ingredients now!!! My pleasure, Ingrid. Good luck reaching your ideal weight – you can do it! i need to know about the banana smoothie.. as i know the banana shake is use for gaining some weight then how it will help in weight loss please tell me.. i am really confused. and secondly what about greek yogurt? should i use normal yogurt ? Bananas are ok in small amounts or moderation for weight loss. Greek yogurt his preferable. Normal yogurt is fine though. First off I would like to say thank you for taking your time and giving your knowledge to help myself and others in our journey to become healthier. I have seen so many wonderful smoothie recipes you your site and others. Some are for Detox/Cleanse and some are for weight loss, some boost your immune system, and some have anti-inflammatory properties. You have stated that you shouldn’t drink more than one or two smoothies daily, however what if you need to encompass all these into your diet for better overall health? Should these different types of smoothies be rotated on a daily or weekly regimen? Would you by chance have an ultimate smoothie recipe or 2 that encompasses all four of these health benefits that could be consumed on a daily basis? Very astute observation and question. The detox smoothies are only meant for a week straight, or less, at a time. Typically, you want to detox a couple times a year, spring and summer being ideal. I like to spring clean my home and body at the same time. That said, many of the detox ingredients can be incorporated into your everyday smoothies and food. That way you’re always doing a little detoxing and not allowing toxins to build up too much. Oh, double the recipe for two. I can’t personally attest to having smoothies for dinner regularly, but don’t see any reason that it wouldn’t work. I like smoothies in the morning because they’re quick and easy to make, and digest so easily. It’s usually a mad dash for me on work mornings. I say give it a try and track the results. Just wanted to drop a line to thank you for your wonderful advice and motivation! My pleasure, Trisha. Best, Ryan. Ryan you’ve come to my life just at the right time. Thanx for all the info on smoothies. My weight was just getting out of hand but now i believe am going to shed it off with your help. You are Godsend. Thanx and cheerz. You’re very welcome, Mildred. Thanks for the kind words and best of luck losing weight. Best, Ryan. Absolutely, Tia :) I recommend a smoothie and two regular meals a day. Whichever meal you have a smoothie is entirely up to you. I’ve never done smoothies before but would love to try. My own dilemma is that I am a type 2 diabetic and can’t seem to find that balance I need to regulate my blood sugars. Is this really safe and healthy for someone like me? Considering your condition I suggest you goes easy on the sweet fruit. I would stick to berries and avocado to prevent spiking your blood sugar. Coincidentally, that’s also recommended for weight loss smoothies. To sweeten your smoothies, try stevia, which contains no carbohydrates and no calories and accordingly has a glycemic index of zero. A properly crafted smoothie can be both safe and healthy. When adding coconut oil, should it be in liquid or solid form? It doesn’t matter, Kathy. I actually find it blends better when solid which seems counterintuitive. In liquid form it likes to clump to frozen fruit and ice so I recommend blending everything and then drizzling it on for one final blend. Overall, that’s a pretty healthy smoothie. The one ingredient I don’t recommend is soy milk. Soy milk and other non-fermented soy products should be avoided. Soy is not the health food many have been lead to believe by million dollar advertising campaigns. It’s been linked to breast cancer, brain damage, infant abnormalities, thyroid disorders, kidney stones, impaired fertility, and many other ill health effects. For more info on soy, see The Whole Soy Story: The Dark Side of America’s Favorite Health Food by Kaayla T. Daniel. Try almond, coconut, hemp, or raw milk. I would also add a tablespoon of coconut oil to round out your smoothie with some healthy fat. Hi Ryan Thank you so much for that info I will go back to Almond milk and add the coconut oil! Hello, I am preparing to have my second child. I am doing my research now to lose weight, I did weight watchers before and was successful but I want to try something different. I did lose weight before doing protein shakes with fruit. I am going to try smoothies, they are easy and I just wanted to know if I were to use your recipes and add stevia how much should I add? I also wanted to know if it were ok to use organic, half cup rolled oats in a smoothie with banana, cinnamon, teaspoon of coconut oil and chia seeds with one cup of almond milk for a breakfast smoothie? is it bad for weight loss to use the oats?…I really have to loose about 50 pounds and I need advice. Thanks! Stevia comes in a couple forms, liquid, powder, and dried herb. The liquid and powder are typically highly concentrated so only a little is needed. The dried herb isn’t quite as powerful. Start out with the recommended dose and adjust based on your preferences. hello. i would like to start off by saying great recipes. i have just started using smoothies ..i normally juice but was wondering if i do a smoothie for breakfast could i still juice throughout the day. will this still help with weight loss. Thanks and welcome to the wonderful world of healthy smoothies :) Sure you can have a smoothie for breakfast and juice throughout the day. This approach should help you lose weight, but I can’t say for sure as there’s other factors. I would have a smoothie for breakfast, two regular meals, and juice in between meals.